The object of proper files management is to be able to find the record you need quickly and economically, regardless of its format. Our Files Management Planning manual provides guidance for establishing and maintaining the records of your office by the most efficient and economical means available. Each University office has the primary legal responsibility for the proper care and management of its records. To meet this responsibility each office should designate a Records Authority and Records Coordinator. Higher productivity and lower costs are the main benefits of good files management. The right filing system produces important tangible results and eliminates costs associated with poor procedures. A good filing system is developed through a basic file plan. Planning is important because it establishes direction and control, ensures that everyone involved has a common understanding of purpose and goals, provides guidelines, and identifies the elements of a project. One individual should be assigned the responsibility for developing and coordinating the new filing system. This task usually falls to the Records Coordinator. The Records Coordinator may work in conjunction with the Records Authority or with a committee established for that purpose. The Records Coordinator may implement the system or may supervise others in its implementation. The first step in developing or improving a filing system is to gain the support of both the administration and the users of the system. Administrative support legitimizes the project and ensures the cooperation of all members of the office. Every member of the office must understand the purpose and scope of the project. Everyone should be involved in the process. The creator of a record may provide important insight useful during the analysis of the records. Office members can help determine which features or aspects of the present system work well and should be retained. Office members can also help identify specific problems within the present system that must be changed. Most importantly, involving others in the process makes them more amenable to using the system once it is implemented. Any changes to a filing system must begin with an inventory. An inventory is a detailed listing of all existing files in an office. Without information gained through an inventory, it would be impossible to develop or make changes to a filing system. The inventory is the foundation of a filing system. 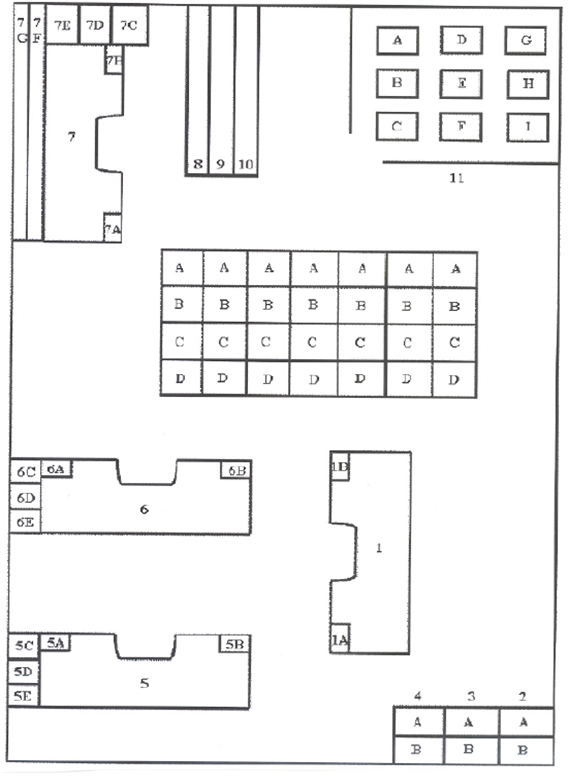 Before beginning, it is very useful to create a map of each room to be inventoried. The map should identify individual filing cabinets, shelves, desks, computers, and other areas where information may be stored. For future reference, the files listed on the inventory should correspond to file locations identified on the map. An inventory should list the title and dates of each file created within the office. Within each room, inventory the files in a systematic manner. Start at one end of the room and work around the perimeter of the room. Once the perimeter is complete, inventory the files stored in the center of the room. Do not forget to inventory files on top of and under file cabinets, desks, shelves and other furniture. Finally, inventory each PC. There are no set answers to these questions. Effective analysis requires that a common-sense approach be taken. The goal is to make a new system work, not just look good on paper. Analysis is the process of reviewing all information which has been collected, manipulating that information within the functional and operational requirements of the office, and then drawing conclusions. The most efficient and economical filing system is one that works well for the office and is easily understood by its users. Very often the simplest method is best. Final factors to bear in mind when establishing a filing system: ready identification and retrieval of individual records and files; segregation and security of information requiring special protection. Classification is a tool of analysis. It is a method of sorting information into like groups. Identifying primary classifications within each office and sorting files identified on the inventory into those primary classifications is the first step in the development of a filing system. Primary classification describes the broadest and most fundamental distinctions to be made between the records of an office. All records are created as the result of functions and responsibilities which reflect purpose, mission, projects, activities, and programs. Just as each office is different, so may their primary file classifications differ. It is not unusual for administrative and organizational files to fall into the same primary classification. Some offices will have program files but not case files, while for others the reverse may be true. Primary file classifications should be based on the function of the office. Remember, identifying primary classifications is only a tool. It is not the final goal. Within the four primary classifications, files are sorted into record series. Identifying appropriate record series is the second and most important step in developing a filing system. A record series is a group of records that are created, used and filed as a unit because they relate to a particular subject or function, result from the same activity, or have a particular physical form. All files must be classified by record series. A paper filing system is managed on the basis of its record series, not by individual folders. Examples of common record series are: Committee Files; Personnel Files; Time Records for Classified and Professional Staff; Payroll Records for Grants/Contracts; Purchase Records -- Internal; and Planning Files. A major consideration in the development of a filing system is the retention of the records. Record retention periods provide valuable clues for sorting files into the appropriate record series. Many times records with the same retention will belong to the same record series. Record retention periods are found on a Records Retention Schedule. Retention schedules clearly state how long a record must legally be kept and whether the record is archival. Retention schedules also provide guidelines for moving files to inactive storage and for purging obsolete records. Although correspondence may comprise only a small percentage of the total volume of records, it poses the most problems for many offices. Correspondence consists of unique documents which are often difficult to classify. Each office may have a different attitude toward how correspondence should be filed and different requirements for retrieving information from the file system. Correspondence may consist of incoming and/or outgoing letters and memoranda. Classically, correspondence has been filed in chronological order. Retrieval depended on remembering the date of receipt or of transmittal. For many people this is very difficult. Information is rarely retrieved on the basis of occurrence. Email is similar to correspondence in many ways. Emails are sent or received based on date and time, not on content. This is one of the characteristics that make email so difficult to manage. Each email is different than the one sent before and will be different than the email sent after. Managing emails by date is rarely effective. Like correspondence, it is much easier to manage emails based on content or creator. Information is most commonly retrieved on the basis of content or creator. It is, therefore, most logical to file correspondence or email either by subject (with related information); by creator; by department from which it is received; or by department to which it is directed. It must be kept in mind that each office function is different, and it is necessary to tailor the management of correspondence files and email to respond to individual requirements. Some offices, as a cross-reference, find it useful to file a second copy of outgoing correspondence chronologically. When following this practice, it is important to remember that this second set of correspondence is a duplicate and can be destroyed at any time. Correspondence may be filed in paper format or kept electronically. The goal is to standardize official format. Either all correspondence within a specific record series is printed, or all correspondence within that series is maintained electronically. Any duplication, whether paper or electronic, falls under "Material That May Be Disposed Of Without A Specific Retention Period." At this time, email may be either printed and integrated into the paper filing system or may be kept within the email system (email client). If maintained electronically, email should be moved from the inbox and sent mailbox into appropriately labeled folders. These folder titles should match the titles used in the paper filing system. Records which have reached the end of their retention period and are not archival can be considered obsolete. Obsolete records should be purged on a regular basis. Duplicates and other material that may be disposed of without a specific records retention period can be purged at any time. Confidential records must be shredded. Vital records are recorded information, regardless of medium or format, that must be protected in case of disaster. Major considerations in establishing a filing system are the identification and protection of vital records. Once the analysis is complete, a filing system can be developed. A filing system should be developed on paper before it is physically implemented. Folders should be sorted, on paper, into the appropriate primary classification. Within each primary classification folders are sorted, on paper, into record series. There are always some records that don't fit neatly into a record series. In many cases they are really either "Material That May Be Disposed Of Without A Specific Retention Period" or unsolicited material. Neither should be included in the filing system. Materials without a specific retention period can be destroyed or should be managed separately. Unsolicited material can be destroyed. In the case of electronic records - word processing or email - the records can be saved to a directory which would be the electronic equivalent of sorting the files into primary classifications. Within each directory files can be sorted into folders which would be the same as sorting paper files into record series. Dictionary order -- each subject is provided its own folder. Encyclopedic order -- subjects are grouped into major headings. Individual folders are filed in alphabetical order behind each heading. Chronological -- a chronological system is most useful for records that are created and monitored on a daily basis. Folders are arranged by sequential date order. It is, however, recommended that chronological filing be avoided. Retrieval can be slow and difficult as few people tend to remember dates accurately. The date of occurrence is rarely the basis for retrieval of information. Geographical -- information is arranged alphabetically by geographical of place name. Serial number -- used for files which have a preprinted number. Works best for records that are assigned a number on creation, e.g., invoices and purchase requests. Digit filing -- uses an applied number to identify folders, e.g., social security number, student number, patient number, budget number. Works best for record series containing large numbers of records. Centralized filing places all records series in one central location in an office. It is most useful when the majority of individuals within an office require access to a majority of the files. The electronic equivalent to centralized filing would be a shared directory like an I drive. Decentralized filing physically locates record series in different places within an office. It is most useful when only one individual requires access to a specific record series. The electronic equivalent would be an individual’s access to their PC. In this case, it works only if the creator of the files is the only user of the files. It is possible for an office to have both a centralized and decentralized filing system. The majority of the record series may be filed centrally, while a specific record series is located near its primary user. A centralized system should not be imposed on records accessed by one individual, nor should individuals within an office have to routinely search several physical locations to find the record they need. Remember, filing systems should reflect the function and organization of an office. There is no easy way to implement a new filing system. It is a very labor intensive task. If at all possible, it is recommended that the filing system be implemented in stages, by primary classification--one record series at a time. Filing systems will fail if all users do not follow uniform and consistent procedures. Training is necessary to ensure a thorough understanding of, and compliance with, new procedures. Training is best conducted through "live" sessions. Training sessions should be conducted by the Records Authority/Coordinator or by the individuals responsible for developing the new filing system. Records Management Services staff are available to assist in preparing and/or presenting a training session. After a test period meet with users to identify problems. Work with users to resolve inconsistencies and formulate implementable solutions. Written filing policies and procedures are useful tools which help ensure the success of the new system. Written policies help ensure that the new system will be understood by all and will succeed.